I've read about 'Rundowns' in a number of my vegetarian cookbooks, to name a few: Delicious Jamaica; Caribbean & African Cookery, and The Rasta Cookbook, but never got round to making any of the recipes in these cookbooks at home. But when I saw it on the menu at a restaurant in the big, bustling and diverse city of Bristol, England, I just had to have it. We went there a couple of years back with friends from Brittany. I had the Rastafari Rundown with butter beans, corn cob, greens carrot, sweet potato, herbs, coconut milk served with Rice'n'peas and fried dumplings. It came in an oval shaped enamel pot. It was my first time and it was really good. However, the second time we went there, it was not so good - the rice was not good at all and sadly the dumplings were stale, we never went back again. 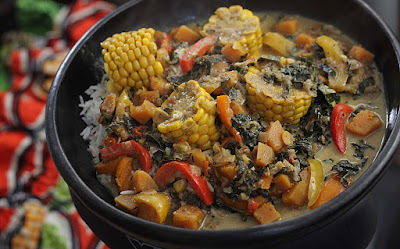 Anyway, a 'rundown' is a method of reducing coconut milk slowly to achieve a thick creamy sauce, it is usually cooked with meat, fish or saltfish, but there are plenty of vegetarian variations around. Rosamund Grant, the author of Caribbean & African Cookery writes 'Rundown' could have been taken to the Caribbean from Indonesia by the Dutch. They have a similar dish called 'Rendang' which has almost the same pronounciation'. I have been wanting to make a vegetarian 'Rundown' at home for a long while, and it only happened because I had most of the ingredients and more coincidentally Vegan Mofo prompt was to 'recreate a restaurant meal'. And what is good, is that this recipe is naturally vegan. Its packed with loads of colourful vegetable: butternut squash, sweet potato, red and yellow peppers, greens from my garden and my favourite part of the whole meal was actually the sweetcorn, that were grown locally. Pretend you enjoying this on a sandy beach somewhere in the Caribbean, not where I am - wet, windy Wales, but it is home and I wouldn't be anywhere else right now. 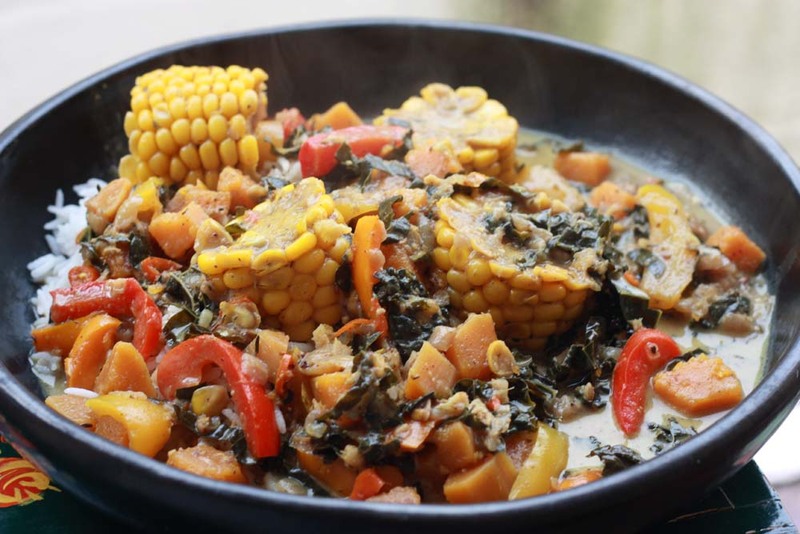 Taste and adjust seasoning if necessary and stir in the coconut milk and allow to simmer on low heat uncovered for 10 minutes or until the sauce has begun to thicken. 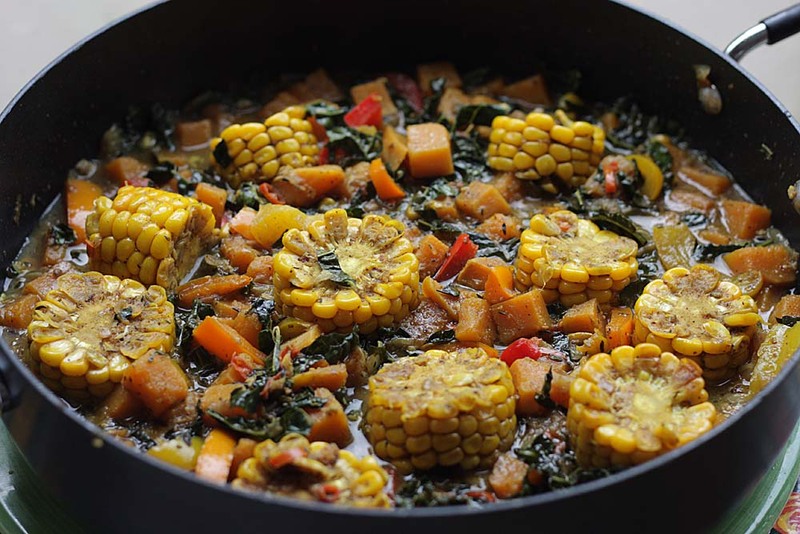 Serve with either rice'n'peas or fried dumplings. That's really interesting - I've heard of rundowns before, but I didn't really know what they involved, or about the rendang thing. Now I know what they are, I'm looking forward to making my own - I love dumplings in all forms, ditto coconut sauces! Thank you Joey, I hope you do make your own - let me know. I like crispy pillowy dumplings, still unsure about those that are simmered. Thank you so much Janet. I am glad you like this. I love learning about new culinary styles/dishes, and Rundown is a new of for me. It looks like big bowl of delicious goodness. I really like the way you've left the sweet corn on the cob. This is going on my "to-make" list. Oh I am so pleased you like the look of this, yes the sweetcorn I liked it like this, but I know some people would struggle to eat off the cob, so its an option. Let me know if you make it. That rundown looks really impressive - I am sure you could serve it at a dinner party and get oohs and aahs - I am curious about the sorts of dumplings you had on yours - are they like scones but cooked on top? Thank you Johanna. In the right bowls, it would def. get wow. The dumplings are traditionally known as Jonny cakes, shallow or deep fried, not like scones or puffy dumplings cooked on top at all. I will make them some day and share, should have done it here really, sorry. Ital is vital, yes indeed. that sounds divine!... I love the idea of going vegan but I would be so afraid! wow wow I love the look of this, especially as rendang was my favourite meal pre-vegan so I love that connection! I haven't found a vegan rendang equivalent that tastes the same as the one a friend's mum used to make about 20 years ago and none of the recipes I've tried taste the same! Oh thank you sooooo much. I don't think i have ever had a Rendang have recipes bookmarked for it, so will need to dig those cookbooks out. Mmm I love the depth of this dish and the cuts of corn look so cool! That looks amazing Shaheen. Thanks for submitting it to Meat Free Monday, the roundup is now live. PS it's a featured recipe. Pinned!